As previously announced, Thomas Studios is fully booked. That studio booking has just been extended until November 15'th. Accordingly, parking at Thomas FX will be limited until that time. If you plan to visit us this month, please park on the south side of our parking lot. We ask all store customers for their support. 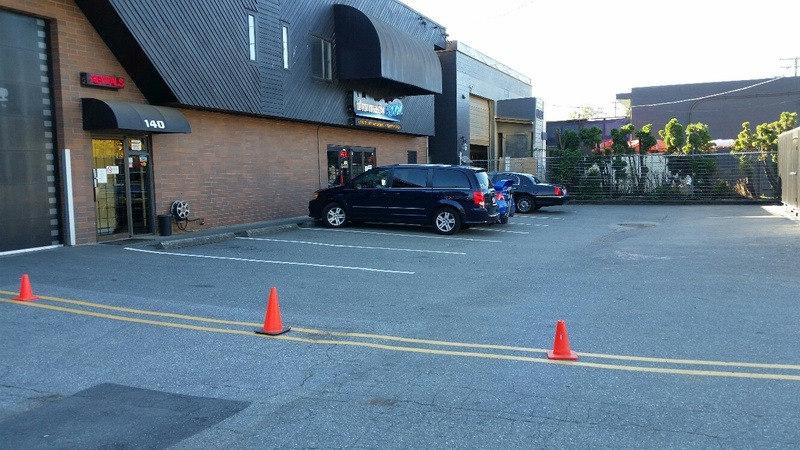 Respect the parking cones that have been placed down our double yellow centre line and preserve the privacy of the film crew parking on the north side of our lot. Unfortunately, available customer parking will be reduced by 50%. during the entire busy month of October. We apologize in advance for this inconvenience. If the south side of our lot is full when you arrive, there should be street parking available nearby for overflow parking. Even if no vehicles are present on the North lot when you arrive, numerous crew vehicles could appear unannounced at any time of day or night so the North Lot must be kept clear at all times for their convenience. This year is NOT "business" as usual at Thomas FX . . . Rather, we are deeply enmeshed in our "usual" business, which is supporting the Film & Television Industry. WARNING: Unauthorized vehicles parked on the north side of our lot will be towed without notice, at their owner's expense.